“Thou shall go H.A.M. 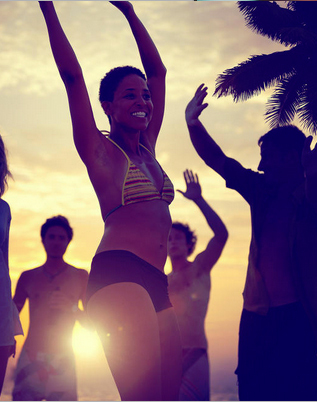 all weekend long” and “Thou shall party until the sun comes up the following day” are just a few of the unofficial rules for Urban Hangover 4, the premier summer get-away for urban professionals. Hip hop legend Doug E. Fresh is the official emcee of this year’s three-day beach event being held August 7-9 in San Juan, Puerto Rico. The jam-packed itinerary includes activities like the beach Olympics, day trips, local club hopping and a Diamond/White Summer Soiree. While there will be plenty of partying, it’s the quality networking opportunities that set Urban Hangover apart from other destination events. Author and entrepreneur Dr. George Fraser will lead a two-hour Power Networking Workshop. A breakfast business card exchange and a “Cocktails & Connections” reception are also on the schedule. Urban Hangover Executive Director Jerome “JayDee” Davis says that attendees—most of whom are college-educated business owners—build partnerships and often stay connected long after they return home. The Puerto Rican weekend is merely the foundation for continued networking and relationship-building. Once Urban Hangover 4 has ended, attendees will be able to stay connected by joining UrbanProfessionals.com. Based in Atlanta, this free professional web-based directory provides another avenue for entrepreneurs to collaborate and do business with each other. For more information about Urban Hangover, visit urbanhangover.com.